Marketing, Rhetoric and Control investigates the tensions that surround the place of persuasion (and, more broadly, control) in marketing. Persuasion has variously been seen as an embarrassment to the discipline, a target for anti-marketing sentiment, the source of marketing’s value in the modern organisation, a mysterious black box inside the otherwise rational and logical endeavour of enterprise, and a rather insignificant part of the marketing programme. 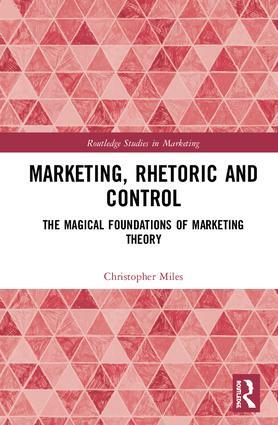 This book argues that this multifarious reputation for persuasion within marketing stems from the influence of two quite oppositional paradigms – the scientific and the magico-rhetorical – that ebb and flow across the discourses of its discipline and practice. Constructing an interface between original, challenging close readings of texts from the beginnings of the Western rhetorical tradition and an examination of the ways in which marketing has set about describing itself, this text argues for a Sophistic interpretation of marketing. From this perspective, marketing is understood as providing intermediary services to facilitate the continuing exchange of attention and regard between firm/client and stakeholders. It seeks to manage and direct this exchange through an appreciation of the changing rational and irrational motivations of the firm and stakeholders, using these as resources for the construction of both planned and improvised persuasive interactions in agonistic (or competitive) environments. This book is aimed primarily at researchers and academics working in the fields of marketing, marketing communications, and the related disciplines of marketing theory, critical marketing, and digital marketing. It will also be of value to marketing academics in business schools, including those working in the areas of media and communication studies who have an interest in commercial and corporate communication, brand use of interactive media, and communication theory. Chris Miles is a Senior Lecturer in Marketing & Communication at Bournemouth University, UK.